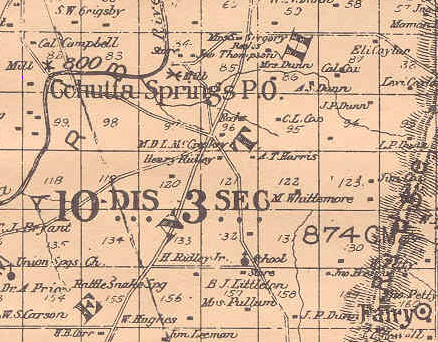 The place name of Cohutta Springs appears on Murray County maps in at least three locations, not including North Cohutta Springs, which makes a fourth. It can become quite confusing for researchers. Genealogists whose families were listed at Cohutta Springs in the 1860s should look closely at this "other" Cohutta Springs, in the Tenth District, Third Section of Murray County (I'll call it Cohutta Springs West, to clarify ). This Cohutta Springs is southwest of Cisco, Georgia in the Tenth District, Third Section of Murray County. It is west of the community of Fairy. "Oakwood," a privately owned antebellum plantation sits at the crossroad of what is now Halls Chapel Road and Georgia Highway 225. At various times in its history, the plantation and the area around it was known locally as Waterhouse's farm, McCroskey's, or Colvard's plantation. The area on old maps was designated long ago as Cohutta Springs, as it appears on very early state and county maps. It also had a well spring where people came to draw drinking water. The spring eventually ran dry and was filled with dirt. Waterhouse's farm is mentioned in Civil War correspondence as a place where Union scouts rendezvoused while scouting the Confederate-held Spring Place, just before the Atlanta Campaign. During or after the Civil War, a Confederate, Major M.D.L. McCroskey, bought the Waterhouse plantation. His name appears on this map, on land lot 96 in the Tenth and Third, just east of the five-way intersection. Mail delivery was spotty in the early history of Murray County. Callaway Campbell, a resident of this Cohutta Springs area that is west of Cisco (land lot 82 on map), has difficulty getting mail when he first moves into Murray, before the Civil War. Later, mail delivery became easier after a post office opened in his area. Cal Campbell's land is to the north west, almost cater-cornered, and shows a mill (land lot 82). In the 1860s, folks in Cisco and west of there were listed in census as residing in the Tenth District, Cohutta Springs. In other census years, it may show Tenth District, 874, and other designations. Much later, it became known as Colvard's, after a physician who owned the plantation and ran a store at the crossroads. There was also a big spring, which became known as Colvard's spring. Residents of the Cisco area, at least those west of the ridge, were listed in 1860 census as residing in the Tenth District, Cohutta Springs. In the 1880s, some of them file pension applications, listing Cohutta Springs as their address. Great information! I really love the direction you are going with this blog. I noticed that you are using the Map of Murray County that was surveyed in 1892, and it looks like you may have an original copy? I can't tell, but color makes it appear that way. I have a reprint, but it's not the best quality. If you do indeed have an original, or a good copy of the original, could you clue me in as where it came from? I would love to have a better copy than what I have right now! Mine is not an original copy ~ that is, it's not an antique but a reproduction. I did have access to the original at one time. I've had my copy for over a decade, maybe two, and the paper has become discolored. If yours is from the Web, you might get a better copy from Whitfield-Murray Historical Society [http://www.whitfield-murrayhistoricalsociety.org/]. They sell it as an 18x24-inch copy on white paper. The quality is pretty good, considering the original they copied it from (parts kind of blurry, old type fonts run together ~ but otherwise usable). I'm not sure where they copied the original one from. They have some old maps, but I don't know if they have an original of that one. A state archive might be another source. Georgia's State Archives seem to have moved, but I notice there is now a NARA Division, Southeastern Region, in Atlanta. I didn't even know it existed, so that might be worth checking: http://www.archives.gov/southeast/ Thanks for reading my blog! Oh, by the way--thanks for the date of survey for that map ~ I'll update the post on that. I wasn't sure. I knew it was post-Civil War and probably post-1885, but couldn't find the original date. Well keep up the great work! I look forward to seeing what all you have in store for Cohutta Springs History!